Last year when Toys R Us filed for bankruptcy protection, I wrote a post about how their real problem was the private equity firms that acquired them, saddled them with instant debt of billions of dollars and replaced their management with people who had no prior experience in the toy industry, or even retail, before that. Yesterday TRU announced the closure of over 180 stores. That’s about 20 percent of their American retail base. The reason suggested by their filings was that these were stores that overlapped service areas, and many were just a fifteen minute drive from another TRU location. The truth is that these were stores that either had leases expiring, or leases that could be broken without any major financial penalties. Amazingly, none of the stores closed in this round are located in West Virginia. You can find a full list of stores that are closing HERE. In an email from Dave Brandon, the CEO of Toys R Us, he did his best to assure customers that the store closings were part of what needed to be done to keep the company going, and assured everyone that all their commitments would be honored. He also promised a more robust loyalty program, more competitive prices and an improved online store experience. This is not likely to be the last round of store closings by Toys R Us. Some analysts think that they need to shutter another three hundred stores to ever have a chance of emerging from bankruptcy intact. They are still carrying five billion dollars in debt, and closing so many stores is only going to make it harder for them to earn enough money to pay down those debts. Right now, they still control about 20% of the market share in toys in this country, but as they shut down more stores, and other retailers like Walgreens and Kroger get more agressive about carrying toys, especially during the all-important Christmas season, that market share is bound to shrink. Some analysts see Target as the big winner here, because so many of the TRU locations that are closing are in the same shopping centers as Target stores. We shall hope for the best and wish that TRU can pull out of this tailspin before they hit the ground. Factory Entertainment announced that they will unveil a new take on vinyl figures at the International Toy Fair in New York next month. 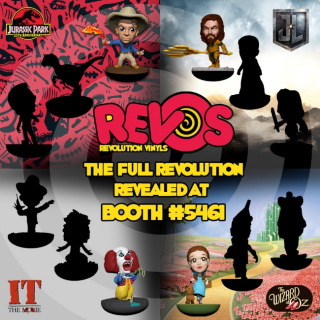 REVOs (pronounced rē-vōs) are, according to them, the world’s first vinyl figures with a unique twist, collectibility and play value. From the teaser image (right), it looks like these will be figures that can spin around on a Weeble-style base, possibly incorporating bobble-head movements, with multiple points of bobble (pardon me for not knowing the technical term). To be totally honest here, they may not have bobble-head movements. That’s just a guess on my part, based on the photo. They may just be figures with a base that’s rounded on the bottom so that they can spin like tops. Either way, it looks like this might be a new concept that could encroach on the aging Funko Pop line of collectible figures. According to their PR, the secret is a proprietary, self-righting mechanism built into the base of every REVO figure which allows the figure to revolve, rock and wobble. Not having seen them in person, I can’t tell you just exactly how revolutionary this concept is, but with Funko rapidly nearing the end of its fifteen minutes, REVOs may well be the concept that takes their place. The figures are less cartoony than Funko’s, and each four-inch figure comes attached to a base with a rounded bottom, so that they naturally move about a bit. The figures are done in a “big head” style, but they’re much more recognizable than most Funko Pops. So far the announced licenses are Jurassic Park, Justice League, Stephen King’s “It,” and The Wizard of Oz. Many more are expected to be announced soon. Suggested retail for these figures will be around twelve bucks. We’ll keep you posted on how they turn out. In the last two PopCult Gift Guides I’ve recommended books devoted to the art of Dirty Donny Gillies, and now we’re going to point you in the direction of the latest model kit that he’s helped design for AMT. He’s teamed up with the company for a wild interpretation of a marvellous muscle car. Made from modern tooling and featuring intricately detailed parts, AMT’s ’69 GTX is available now from AutoWorld, and they say that it builds up like a dream. 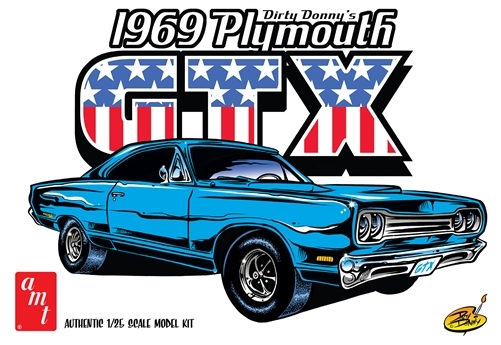 Not content with offering a great muscle car classic, they’ve added in groovy graphic decal designs from Donny the mod monster artist. You also get special packaging designed by Donny. This Skill 2 (requring paint and cement) kit features modern tooling, molded in black with many extra parts included, pad-printed redline tires and all new decal art and package illustrations from Dirty Donny. You can order it from AutoWorld HERE. One of the things we’ll miss because we’re not going to the International Toy Fair in New York this year is chatting with Nick Croce, the man behind NJ Croce Toys. He has a genuine passion for toys and a sense of fun that many in the industry are lacking. NJ Croce makes the cool bendy figures, including Gumby and Pokey, and this year they have a few new entries, which you can see below and to the right. They announced last year that they had acquired the license to produce bendy figures based on Star Trek: The Original Series. We get our first look at those this year, plus we get a new line of cute, super-bendable DC Comics figures and series of products based on the Michael Keaton Batman. NJ Croce offers a lot of other cool bendable figures, like Mr. Bean, Red Sonja, Classic TV Batman, Justice League: New Frontier, Betty Boop, The Simpsons, and more. You can find them for sale at all kinds of places, from Cracker Barrel to Magic Mart to national book retailers and major discount stores. They’re well worth seeking out. 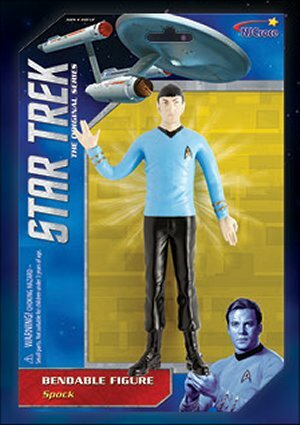 This is the first glimpse of the Star Trek line, due out in March. 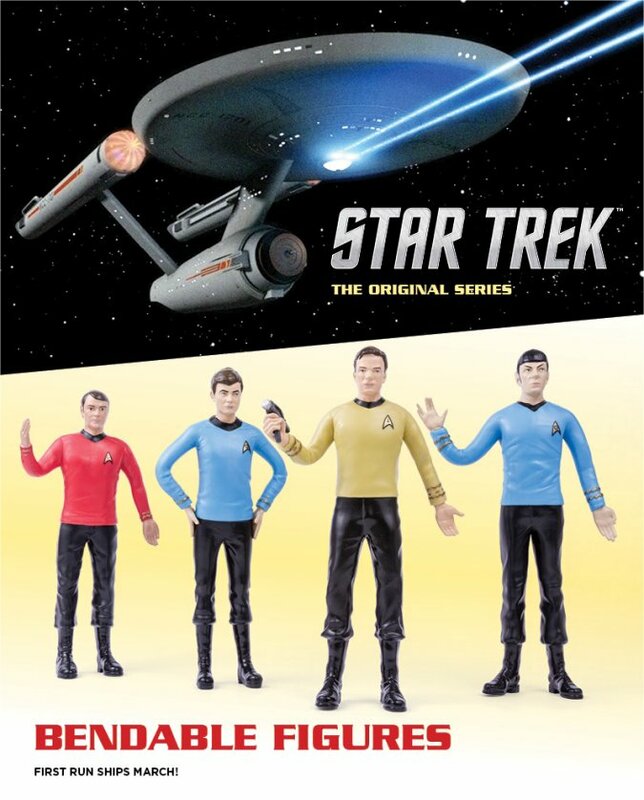 Kirk and Spock will be sold separately, or you can spring for the boxed set and get Scotty and Bones McCoy too. 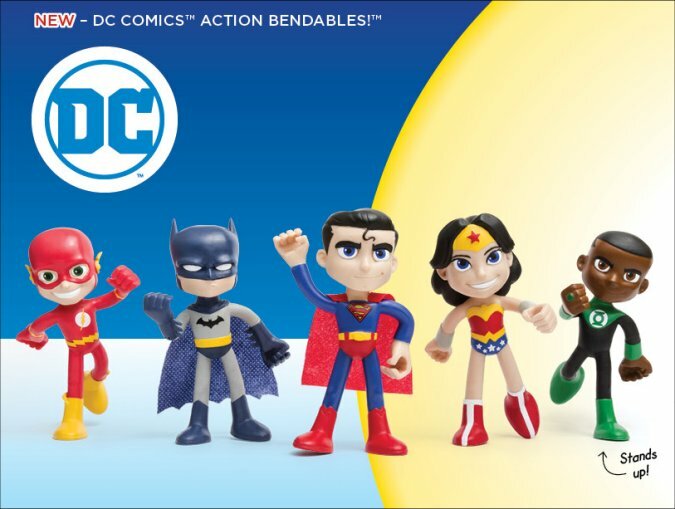 This new line of DC figures will appeal to kids, and they stand on their own and have a greater range of bendability than standard bendys do. Suggested retail is four bucks, and expect Aquaman to be added to the lineup. 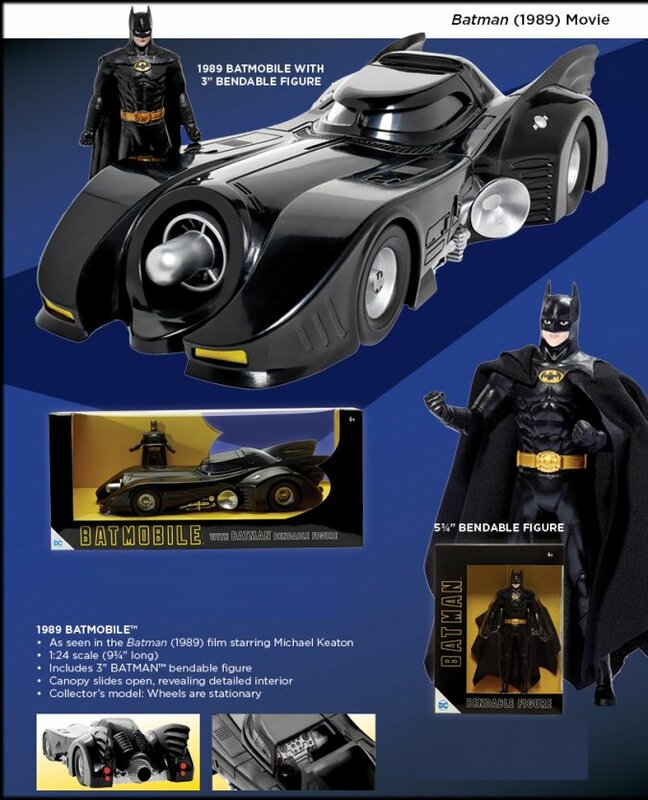 The 1989 Batman movie is well-represented with a figure and a movie Batmobile that comes with a three-inch figure scaled to ride it. Rudy, thank you for the commentary on the sad state of TRU. When I first moved to Columbus there were still a couple of Children’s Palace. Those were pretty much gone around 1991/92. 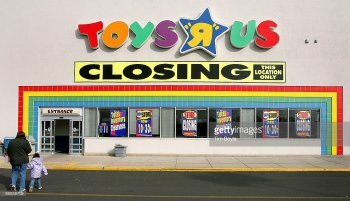 Some of those TRU locations listed as closing were Baby’s R Us. That is the case in Dublin OH, Baby’s R US is closing. Thankfully, for now, Toys R US will still be operating in Dublin OH. That’s true. A closer look at the list shows that many of the stores being closed are Babies R Us locations that are right beside, or close to, Toys R Us. I know that’s the case in Monroeville, PA and Tucson, AZ among other cities. There are other locations being closed that have been open more than forty years. It’s a real shame that Toys R Us may wind up going the way of Kay Bee Toys, Children’s Palace and Family Toy Warehouse. And it’s all due to the private equity firm crippling the company with debt, other wise they’d be able to compete with Amazon, Walmart and Target.